New book Awaken out now! AWAKEN is a book of life-changing inspiration, drawn from the authors’ own profound journeys of transformation and spiritual awakening. Dip into any page for instant spiritual nourishment or read from cover to cover.This mini GPS for the soul belongs in every handbag—it’s a little book that creates big changes. Natalie Grueninger and Karina Machado are sisters who live in the same leafy suburb in Sydney’s south. Natalie is a mum of two, a primary-school teacher and an author of acclaimed historical non-fiction books about the Tudors. Karina is also a mother of two, as well as a magazine journalist and author of a successful trilogy of non-fiction books about the spirit world. After discovering the source of purpose, peace and happiness within, both are passionate about helping other women get reacquainted with their authentic selves, enabling them to live joyful and empowered new lives. 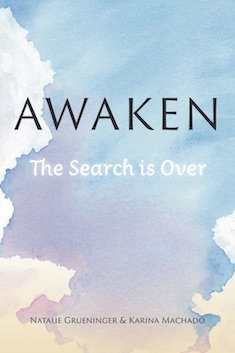 Much of the wisdom in AWAKEN came via Natalie’s meditations, during which she was guided to create this book with Karina and share it with sisters in spirit all around the world. Australian readers can purchase a signed copy of AWAKEN, directly from Karina and Natalie by clicking the link below.